By balancing these elements, we hope to create a higher quality of life for future generations. We are confident that together we can make good choices that will lead to a healthier, safer and more sustainable future for Marin. 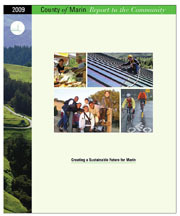 The County of Marin conducted the most recent community satisfaction survey in spring 2009. The survey results, which were presented to the Marin County Board of Supervisors on April 14, 2009, indicated a high level of overall satisfaction as 86 percent of residents were satisfied with County's performance in providing programs and services. The survey, which is conducted every two years, also pointed out highlighted specific services with high importance and satisfaction ratings and pointed out areas for improvement. The results of the 2009 survey have been analyzed to assess the public’s perception of County services compared with the previous survey in 2007. The community survey was conducted using a random telephone sample of county residents and included 750 responses. Approximately 150 respondents were from each of the five supervisorial district to ensure a balance of respondents from across the county. The survey results and County news release are available below.